Corundum is a metal that is mixed with iron to create stronger alloys. The most common alloy is steel, which uses equal amounts of iron and corundum. Smaller amounts of Corundum can be used to create lower-quality alloys that are only slightly stronger than iron; banded iron armor is made this way. Higher-quality alloys can also be created by adding extra corundum to steel, as is done for Advanced Armors, namely scaled and steel plate armor. The most easily accessible corundum mine is Goldenrock Mine, adjacent to Darkwater Crossing in Eastmarch. Although a couple of other locations have more veins, the other locations are inaccessible at the start of the game. 3 Corundum Ores are obtained by mining Corundum Ore Veins. 1 Corundum Ingot is obtained by smelting 2 Corundum Ores. 1 Steel Ingot is obtained by smelting 1 Corundum Ore and 1 Iron Ore.
Corundum Ore may be sold by blacksmiths and general goods merchants starting at level 7. Corundum Ingots may be sold by blacksmiths and general goods merchants at all levels. There are a total of 228 veins, 11 ores, and 14 ingots at guaranteed locations. 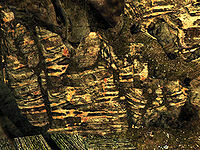 The vast majority of the veins are individual rock outcroppings found scattered outside throughout Skyrim. The following list only includes notable locations, in particular locations where multiple veins are located near each other and interior areas containing veins or ingots. The Corundum Veins category contains a more complete list of places containing single veins. All exterior ore veins are shown on (map). Note, however, that only 50 veins are shown on the map at one time; to see the rest of the veins, click on "Next" at the bottom of the list of results. Falkreath Hold Knifepoint Ridge 19 The veins cannot be accessed until the quest Boethiah's Calling has been started. Eastmarch Abandoned Prison 1 On the river bank opposite the main entrance (map). Corundum (ore or ingot) is one of 4 items needed at the Atronach Forge to create a Staff of the Flame Atronach. 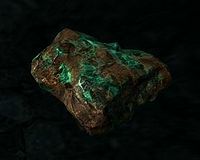 Corundum ore can be sold to Verner Rock-Chucker for the quest Mine Ore.
Corundum ingots are one of multiple items needed at forges to create all varieties of banded iron, scaled, and steel plate armor. One corundum ingot is needed at a workbench to improve all of these same types of armor, as well as Volsung. Unlike other ores, corundum ore is worth exactly half of a corundum ingot. You can save money by buying other types of ore and refining it yourself, but it's more efficient to buy corundum ingots directly, and there is no cost difference. Corundum ore is worth as much as a steel ingot, so buying corundum and iron ores to smelt steel ingots is more costly than buying steel ingots directly. Ore veins of all types sometimes do not respawn normally (see mining bugs). 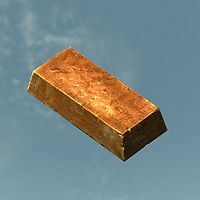 HF Locks use corundum ingots in their creation, safes use steel ingots, and the Shrine of Akatosh uses one corundum ingot. This page was last modified on 2 May 2018, at 20:58.